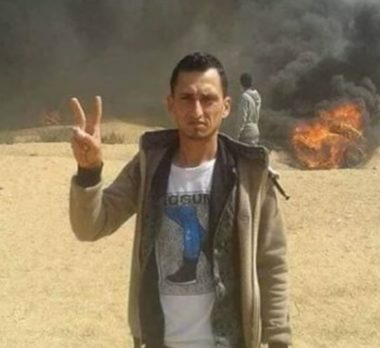 The Health Ministry in the Gaza Strip has confirmed that one Palestinian was killed by Israeli army fire, Friday, while 37 others were injured, during the Great Return March processions near the eastern borders of the besieged Gaza Strip. Dr. Ashraf al-Qedra, the spokesperson of the Health Ministry in Gaza, has reported that a young man, identified as Rami Wael Ishaq Qahman, 28, was shot and seriously injured, before he was rushed to the Gaza European Hospital, where he died from his wounds. The Palestinian was shot with a live round in the neck, east of Rafah, in the southern part of the Gaza Strip., Dr. al-Qedra added. He also confirmed that at least 37 Palestinians were injured with Israeli live ammunition, including six children, nine women and one female paramedic, identified as Falasteen Qdeih, who was shot in the leg. Hundreds of Palestinian protesters held protests close to the eastern borders of the Gaza Strip; tires were set on fire across several areas while Israeli forces fired live ammunition and tear-gas bombs to suppress protesters. 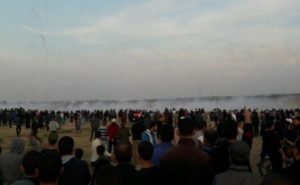 According to the Palestinian Ministry of Health in Gaza, 221 Palestinians have been killed since the beginning of “The Great March of Return” on March 30th, while more than 24,000 others have been injured. “The Great March of Return” protests were launched w ith the participation of thousands of Palestinian civilians in Gaza — which has suffered from a decade-long Israeli siege — who took to the borders to demand their right of return as refugees to their original homelands, now in present-day Israel.